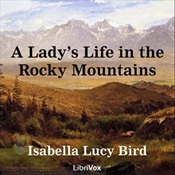 When I read A Lady's Life in the Rocky Mountains I was engrossed. Couldn't put the book down and when I finished I missed Isabella Bird. In 1872, Isabella Bird, daughter of a Bristish clergyman, set off alone to the Antipodes 'in search of health' and found she had embarked on a life of adventurous travel. In 1873, wearing Hawaiian riding dress, she rode her horse through the American Wild West, a terrain only newly opened to pioneer settlement. The letters that make up this volume were first published in 1879. They tell of magnificent, unspoiled landscapes and abundant wildlife, of encounters with rattlesnakes, wolves, pumas and grizzly bears, and her reactions to the volatile passions of the miners and pioneer settlers. A classic account of a truly astounding journey. A wonderful chronicle of a woman homesteader near Estes Park, Colorado. About an inspiring woman of strength, human endurance, and the imagination to live outside the ordinary. This thoroughly researched book has just about all the information available on Allenspark, Colorado's history. It covers mining, tourism, community, schools, and early settlers. The writing style is straightforward and easy to read. Well done. This book tells us as much about the man who wrote it as it tells us about the trails he walked and skied. Even if you never take a single one of his hikes, you need to know the man. He was a broad-shouldered, heavy-set Scotsman who was a sociology professor at the University of Colorado in Boulder. In keeping with his ancestry of pioneers, and frontiersmen, he was a mountain man at heart. Since the Pikes Peak gold rush in the mid-nineteenth century, women have gone into the mountains of Colorado to hike, climb, ski, homestead, botanized, act as guides, practice medicine, and meet a variety of other challenges, whether for sport or for livelihood. Robertson recounts their exploits in a lively, well-illustrated book that measures up to its title.